iCSC-2005 will take place at CERN, IT Amphitheatre. Attendance is free, but participants who register in advance will get a printed version of the handouts as well as a CD. Registering will also help in organizing the logistics of the event. The programme is formed of three themes, selected from proposals made by students via an electronic forum. Because we noted that at regular CSCs, the sum of the knowledge of the students often exceeds that of the lecturer teaching at that time, and that it is not infrequent to find someone in the room who knows more than the lecturer on a particular aspect. Why not to try and exploit this? This is the idea behind iCSC. This is not mandatory if you work on the CERN site. But it is recommended: If you do register, you will get a hard-copy and a CD of the lecture handouts. This will also help us for the logistics. Yes with pleasure. You need to register as an external attendee prior to the event in order to get access to the CERN site. The school lasts three consecutive days. There are three themes, one per day (one theme also extends a bit into the following day). Yes of course, even some lectures only: attendance is fully free. Yes, a printed version and a CD for those who have registered, and web access for the others. 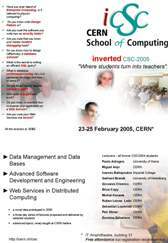 I am a former CSC2004 student. Anything special for me? CSC2004 students interested in contributing in iCSC-2005 made proposals via an electronic discussion forum. The regular school track coordinators selected the best / most relevant proposals and proposed to cluster them into three themes. Theme coordinators were appointed, having full responsibility to finalize the content of their theme and invite lecturers. Yes, the idea is that the lecturers go one step further than the tuition delivered at CSC2004, focusing on novel ideas and technologies. Most of what will be taught at iCSC has never been taught at CERN before.